A new brand identity for a 20th anniversary milestone. Who: Orchard Hill Breadworks bakes wood-fired artisan breads and cookies, made with organic flour and grains in the southern New Hampshire region. 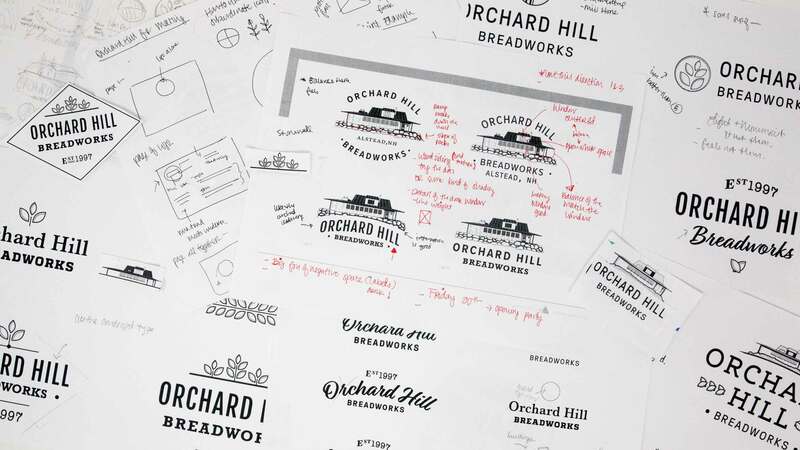 Problem: Orchard Hill Breadworks is highly seen throughout the region, from their local roots, pizza nights, to non-profit community events and beyond, however, their logo felt outdated and did not represent the breadth of their brand or their baked goods. 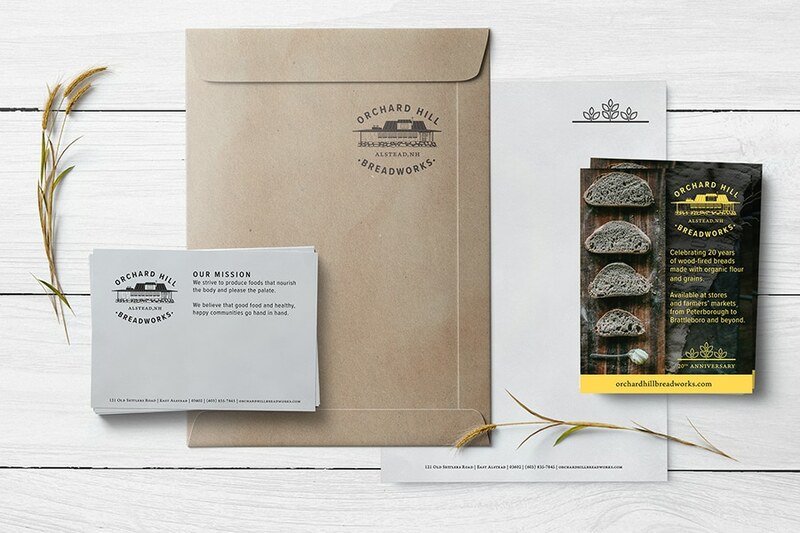 Solution: Tell the visual story of Orchard Hill Breadworks through a new brand identity via a logo redesign, updated collateral, and product labels that would represent the spirit and philosophy of Orchard Hill Breadworks.Noah had been using artwork from various and talented artists through his network of artists and makers for logo and marketing materials. With his 20th anniversary milestone in the fall of 2017, he was determined to rebrand and streamline all of his labeling and marketing efforts. The bakery building has humble and family roots, built next to the family’s 1700s farmhouse, centered on thirty acres of orchards, gardens, fields, and forest. Founder, Noah Elbers, eventually transformed the barn into a state of the art bakery with a new commercial oven, (as well as a home for his family above the bakery). 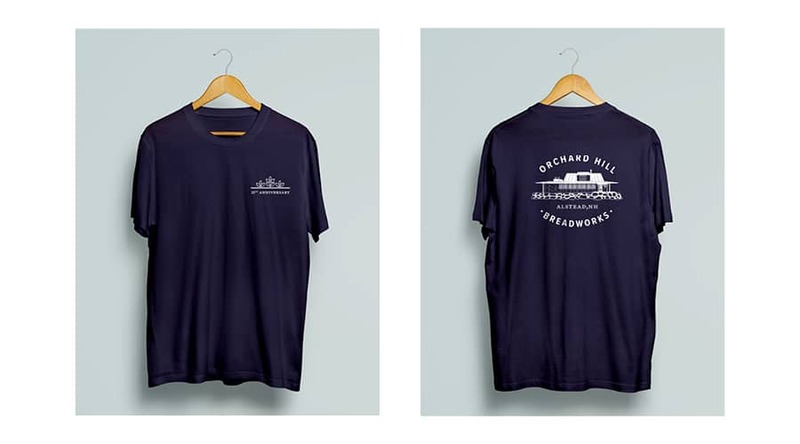 It soon became clear that the bakery building was a centerpiece in the community for local residences and represents the breadth of the Orchard Hill Breadworks spirit. We chose the bakery building and refined it as the main logo and icon for Orchard Hill Breadworks. Additionally, by identifying a mix of modern and traditional typefaces that is versatile in application, we are also able to capture the sentiment of the brand.